January 6, 2016 by John P.
Nikon pretty much shocked everyone at CES with the announcement of the new KeyMission 360 camera, due out later this year. It appears to be a rugged, 4k 360 camera that is waterproof, shockproof, dustproof, and includes electronic vibration reduction. No idea on pricing yet, but expect it to be a premium product. I wouldn’t be surprised if it clocked in around $999 when released. LAS VEGAS, NV – Today, Nikon Inc. announced its entry into the action camera market with the development of an exciting lineup of products that build on Nikon’s legendary excellence in optical technology and imaging innovation. 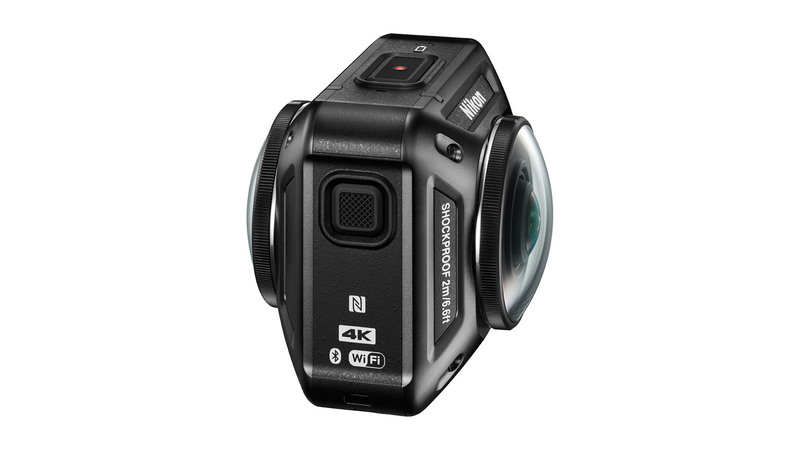 The first in the lineup will be the Nikon KeyMission 360 a rugged camera capable of recording true 360-degree video in 4K UHD allowing users to share new perspectives and explore imagery like never before. The Nikon KeyMission 360 features an image sensor and lens on opposite sides of the device, with images from each combining to create a single immersive, ultra-high-definition 360-degree video and still image. A terrific companion for a wide range of travel, sports or when an adventure takes a turn off the beaten path, the camera is designed be easy to use and withstand the elements. Waterproof (approx. 100 ft./30m), and ready to stand up to dust, shock and low temperatures, the KeyMission 360 also features electronic Vibration Reduction (VR), enabled through applications during playback, that reduces the effects of camera shake to help produce sharp and crisp video quality. Nikon will exhibit reference models of the KeyMission 360 at the Nikon booth at the 2016 Consumer Electronics Show (CES) from Wednesday, January 6 to Saturday, January 9, 2016 in Las Vegas, Nevada. The KeyMission 360, the first of Nikon’s lineup of action cameras, along with a variety of dedicated accessories, will officially be released in Spring 2016. For more information about the KeyMission 360 and other Nikon products, please visit www.nikonusa.com.